As we enter into November, the month of Thanksgiving, we think about all we are thankful for. Being thankful is one of the best things you can do. Why? Gratitude can help improve your health. Changing your attitude to fit a more positive mindset can help reduce depression, reduces stress levels, and strengthens your immune system. Studies have shown that people who regularly practice “giving thanks” are healthier. The term coined “positive psychology” by researcher Robert Emmons from University of California, Davis has shown many health benefits. With these amazing benefits and many more, if you don’t already make giving thanks a part of your daily life, you may want to consider it. Here are a few simple things you can do. Keep a gratitude journal. Recording your feelings can help. Try to write down 5 things a week that you are grateful for. Writing down what you are grateful for can reinforce positive thoughts. Embrace challenges. Grateful people are likely more optimistic, but that doesn’t mean they ignore setbacks. The key is embracing any challenges as a necessary part of your journey. Connect with others. Showing your loved ones that you care and appreciate all they have done for you is important. Expressing this appreciation can bring you closer. Enjoy the little things. Small acts of kindness can go a long way. Compliment others, help someone, give a gift just because, smile at someone. Give back. Volunteering your time for a cause you believe in can help you feel more grateful. 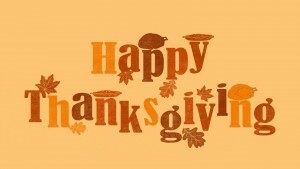 We are very thankful for you, our clients and we appreciate your business. We wish you and yours a Happy Thanksgiving! !